I haven't seen that book. I'll have to keep an eye out for it but the White Sox Encyclopedia by Rich Lindberg also does a great job covering the history of Comiskey Park. I especially like the clip of the Chicago Cardinals playing football at Comiskey. Is this the game you are referring to? I've heard a rumor that MLB has game 1 of the 1959 World Series. They acquired it from the same source that provided them the 1965 All-Star game. Not sure if it was in good enough condition to air, but I'm keeping my fingers crossed they show it this offseason on MLB Network. It is really sad that NBC erased most World Series games before 1969. For example only 45 seconds exist from 1967 and only because Huntley-Brinkley showed highlights of Lonborg just missing a no-hitter in Game 2. But it wasn't just sports - very little exists of Johnny Carson's 10 years in New York. Yes, very unfortunate. There is not much that exists from the 70s as well; only the Sox opener vs Toronto has been preserved. The good news is there are plenty of audio recordings of radio broadcasts from the 50s-70s and items before 1972 are not subject to copyright laws. The Miley collection which includes radio broadcasts of World Series games from 1934 until the 1970s as well as many regular season games from the 50s-70s will be acquired by the Library of Congress after the owner John Miley passes away. (If the LOC says so about the copyright laws that is good enough for me.) I've picked up quite a few from Miley's store Cooperstownmusic as well as his competitor baseaballtapes and it is very cool listening to the 1959 World Series as well as Sox games from the 50s-70s. Any others out there collect them? Well at the local level (especially with the White Sox) - these stations really could not afford to use tape stock and archive games. NBC doesn't have that excuse. Boston was an exception as every game televised from 1972 on exists - the Red Sox paid the stations to do it. I remember reading that a 1964 White Sox-Red Sox game in Fenway was found and was supposed to be aired on MLB Network, but it never turned up. Really? They have never shown/aired any of them at least from the 70s. After 40 years you begin to wonder what they are saving them for if they sit on a shelf and collect dust. Why save them if you are never going to do anything with them??? It is going to air on NESN this winter and then MLB later. It was a very tricky restore as very few 2 inch video tape machines still exist. Tony Conigliaro homered in his first Fenway at bat and Curt Gowdy gushes on air at what a thrill it must be for the local youngster. 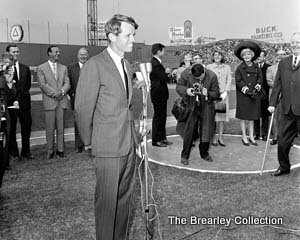 However the reason it exists is that Yawkey donated the gate to what would become the JFK Library and many famous entertainers appeared before the game - Carol Channing sang the anthem. Jackie, Caroline, John Jr, Bobby, Teddy and Rose were at the game. Yawkey paid for the tape to give to the Kennedy family. Even with all that - the game only drew 20,000. Baseball was dead in Boston in 1964. I've heard that the White Sox lost all or most of their 1970's stuff due to a fire at Channel 44- maybe they could at least recover video of games from the opponent's archives? 20,000 was a good crowd in those days. 1,000,000 for a season was the holy grail and figuring double headers in, most teams had around 71 or so home dates, that averages out to only 14,084 per date. Up until 1983 when the Sox hit the 2,000,000 mark the most fans ever to show up for a season for the Sox or Cubs was 1,674,000 by the 69 Cubs with the 77 Sox at 1,657,000. The 29 Cubs held the Chicago record for 30 years when they drew 1,485,000, the 60 Sox finally broke that record with 1,644,000. The Red Sox never drew more than 1,597,000 until the miracle year of 67 when they drew over 1,700,000. Last edited by LITTLE NELL; 11-24-2011 at 11:44 AM. Fenway posted that some museum in New England found it and had turned it over to the MLBN for airing. Naturally nothing came of it apparently. I just found this thread and noticed something that I can't figure out: at 1:02 of the first video from game 1 in 1917, there's a shot of McGraw returning to the Giants' dugout. In the background, there's a black guy sitting with the Giants players in the dugout. It's hard to tell, but it looks like he's dressed in a bow tie. Anyone know who he might have been that he was allowed in the dugout with the players? 30 years before Jackie Robinson, I'm thinking there's no way could have been anything but an equipment manager. That was a hot topic in a yahoo discussion group. One poster and baseball historian "guessed" that it was Giants trainer J.L. Mackall. According to another source the White Sox also had an African American trainer, one William Buckner in that time period. I never heard about a fire. I think the game videos simply were never saved in the first place. Videotape was expensive in those days and took a lot of space to store. Both TV44 and the White Sox were low-budget operations, and there weren't any pennant-clinchers or many historic Sox games in the '70's that would have inspired anybody to save tapes for future generations.